Slabs are surface plane elements that bear loads transverse to their plane. Structure with various types of slabs met in construction "project: slabs"
Most of the times, slabs are statically indeterminate elements that consequently redistribute the stresses applied to them. This ability makes them highly secure against bending and shear failure. Cantilevers are excluded since they are slabs which are statically determinate elements and therefore need special care in their construction. They are those supported on two out of four, opposite sides like S1 of the above example. They are those supported on all four sides like S2, S3 of the above example. They are those with a fixed support on only one out of four sides, like S4 of the above example. They are those supported on three out of four sides, like S5 of the above example. They are those supported on two adjacent sides, like S6 of the above example. The above categorization regards rectangular slabs and is applicable only when the side sup-ports are clearly defined in their full length. When a slab has a general polygonal shape it can be approximately simulated as a similar orthogonal shaped slab. The slab’s essential thickness is determined according to the required flexural and shear strength capacity as well as to the limitations of the allowable elastic deflections. Usually the determinative factor is the second parameter because the slab’s elastic stability (stiffness) is important throughout the entire service life of the structure. Its lack can even become apparent with human walking as it may initiate vibrational motion. 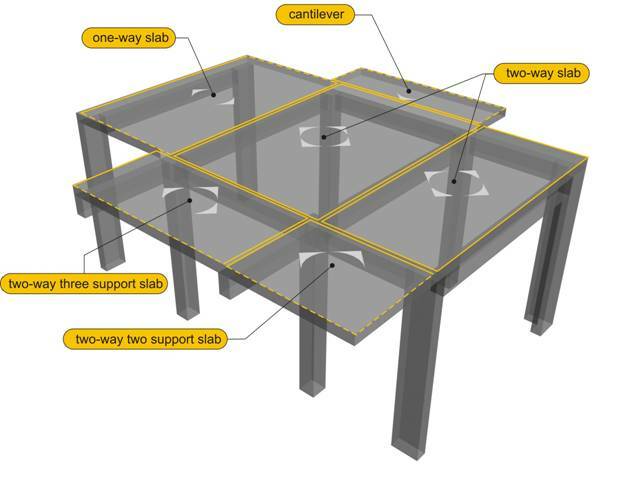 As regards to support, the safest slab is the two-way slab and the most vulnerable is the canti-lever slab. This happens because in a two-way slab, potential loss of one support results in a two-way three support slab, while in the case of a cantilever slab potential support loss results in collapse. Slabs behave better when having one adjacent slab and even better when having two adjacent slabs in both directions. 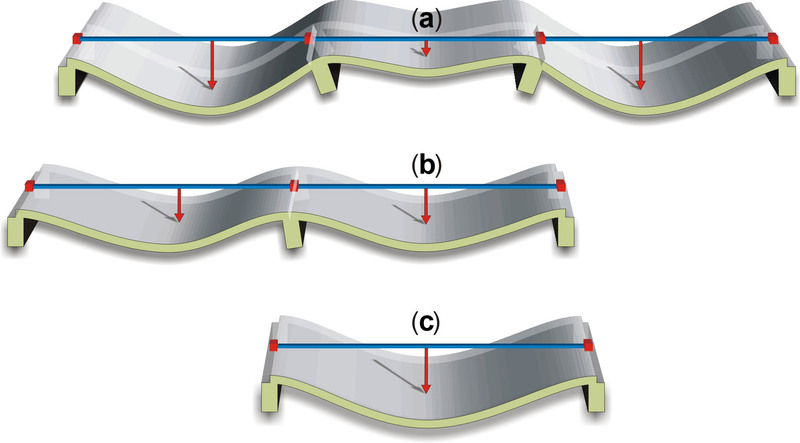 The following picture shows deformations, in a large scale but proportionate to one another, for three different types of slab continuity. It is obvious that continuous slabs suffer lighter deflec-tions thus they have better elastic stability (stiffness). The slab with the bilateral continuity (a) behaves in the best way. Next comes the slab with the unilateral continuity (b) while last comes the slab with no continuity (c). 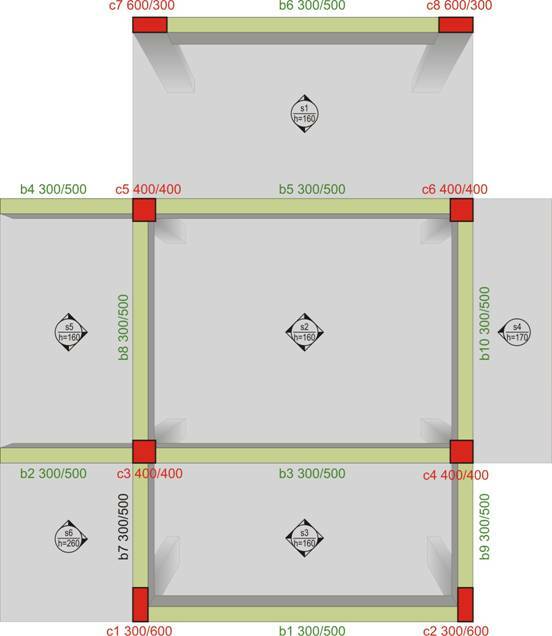 According to Eurocode 2, the required slab thickness depends primarily on the slab dimensions and secondarily, on the loads imposed and the concrete quality. 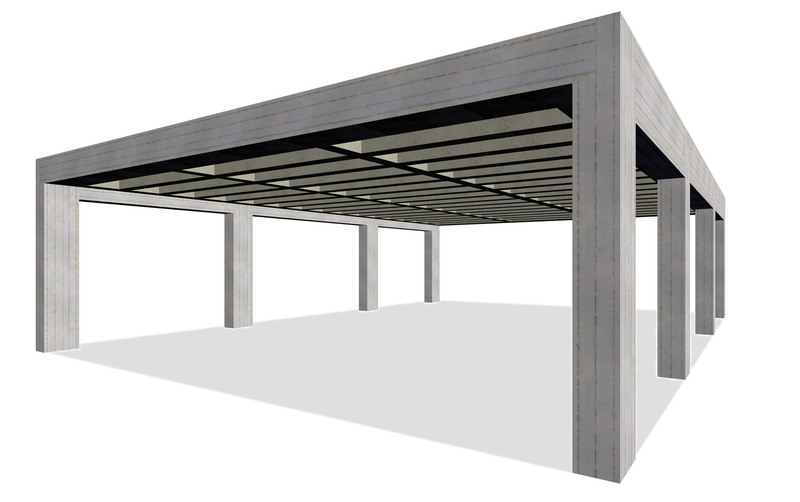 For common loads and materi-als, for slab thickness equal to 150 mm, the slab’s span may vary between 3.60 m and 6.00 m and the cantilever spans may be up to 1.50 m. For slab thickness equal to 20cm the slab’s span may range from 4.80 m to 8.0 m and the cantilever spans may be up to 2.0 m.
The 150 mm thick slab has a self weight equal to 0.150m*25 kN/m³=3.75 kN/m² while the live load due to human use, furniture etc that it is called to bear, is equal to 2.0 kN/m² only. If the slab has a thickness equal to 200 mm its self weight is 5.0 kN/m², and if it is equal to 300 mm its self weight is 7.50 kN/m² whereas the live loads remain the same. 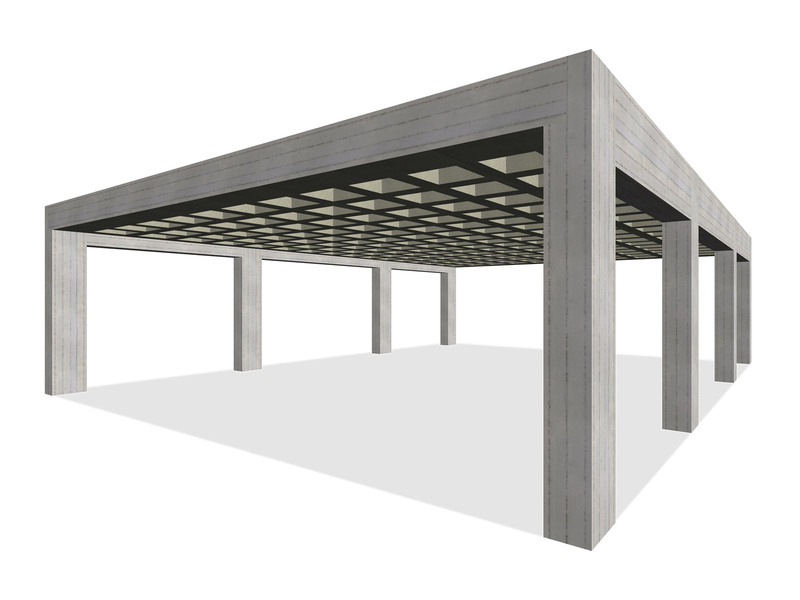 Therefore for large spans ribbed slabs (waffle slabs) (Zoellner, sandwich) can be used, like the one shown in the figure below. A ribbed slab with total thickness of 300 mm may have a self weight equal to 3.75kN/m², which corresponds to the self weight of a 150 mm thick solid slab. Advantages of ribbed slabs:- their large effective thickness provides them with a high level of elastic stability (stiffness),- they have low dead weight consequently they apply relatively light stresses,- they do not overload the structural frame and the foundation,- because of their large effective thickness they comparably need lesser amount of rein-forcement. Disadvantage of ribbed slabs: - Their construction is more challenging and therefore they require meticulous reinforce-ment detailing. One–way ribbed slab "project: zoellner10"
A one-way (simply supported) ribbed slab, in the primary direction is composed by usual ribs while in the secondary direction the ribs are vertical and sparsely placed thus ensuring the even load distribution. Usually two-way slabs have square voids between the ribs because the demand for adequate bending strength is equal in both directions. The square voids are being shaped either with the use of light-weight fillings like polystyrene or with the use of plastic moulds. These moulds have significant constructive advantages (both in terms of quality and construction speed) and as a result they provide economical solutions. Two–way ribbed slab "project: zoellner20"